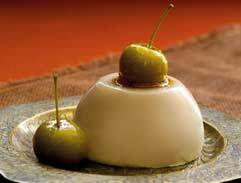 Panna cotta is usually made with buttermilk or yoghurt, which results in a slightly sour flavour. Cream and milk keep the flavour neutral. To prepare raspberry jelly, place raspberries and strawberries in a bowl with sugar, mix and cover with clingfilm. Place bowl over pot of simmering water and leave for an hour over a low heat until berries have released their juices. Refrigerate for an hour before passing through a double layer of muslin; discard the pulp. To make panna cotta, slowly bring cream, sugar and vanilla to boil. 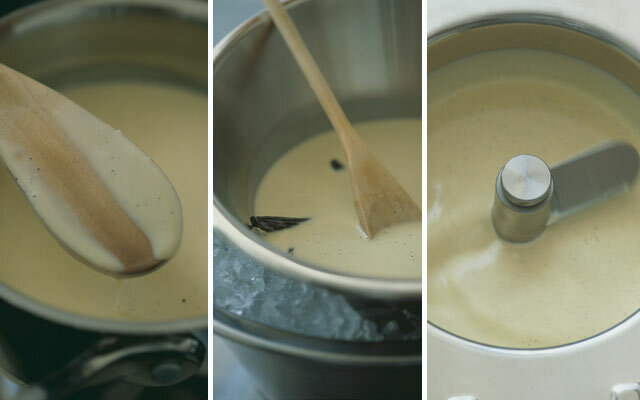 Remove from heat and allow vanilla to infuse the cream for half an hour before passing through a sieve. Soak 3 gelatine leaves in cold water. Add milk to cream and bring back to boil. Squeeze gelatine dry and stir into cream until dissolved; remove from heat. To finish jelly, soak 2 gelatine leaves in cold water and, when soft, squeeze dry. Heat 50ml berry juice in a saucepan, add gelatine and stir until dissolved. Pour into remaining juice and stir. To assemble panna cotta, place a raspberry in base of martini glass and pour jelly over until covered by half; refrigerate for 5 minutes. Cover raspberry entirely with jelly and return to fridge until set. Pour over panna cotta and return to fridge. Once set, arrange a border of raspberries around side of glass and pour in jelly until raspberries covered by half; return to fridge until almost set. Cover raspberries with jelly; refrigerate until set. Pour layer of panna cotta to brim of glass and allow to set in fridge. 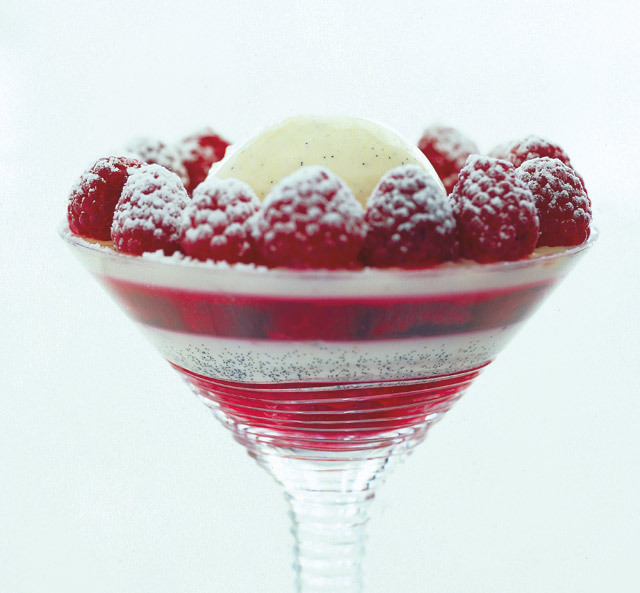 To serve, arrange a border of raspberries around side of glass, lightly dust with icing sugar, then set a scoop of vanilla-bean ice cream in centre. a medium heat, bring milk, cream, vanilla pods and seeds to the boil. Remove from heat and allow vanilla to infuse the milk for 15 minutes. STEP 2 In a large bowl whisk together the egg yolks and sugar until pale and doubled in volume and the sugar has dissolved. STEP 3 Return vanilla-infused milk to heat and bring back to the boil. 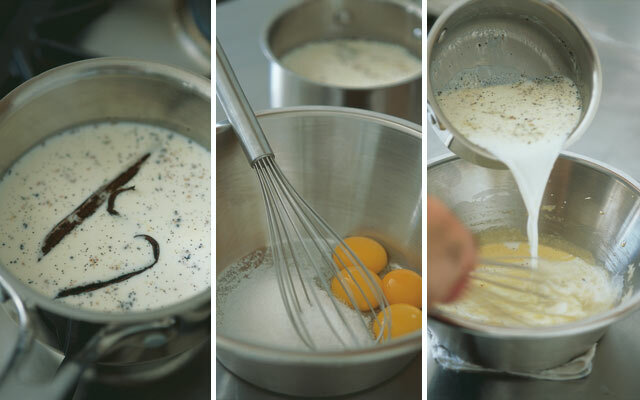 Remove from heat and pour half of milk onto egg-yolk mix and whisk until well blended. Add remaining milk and whisk until well blended. STEP 4 Pour custard mixture into a clean saucepan and cook over a low heat for 8 – 10 minutes until it thickens, stirring continuously with a wooden spoon. and is ready when it has a reading of 82°C/175°C. Do not allow the custard to boil or it will curdle. STEP 5 Strain mixture through a fine sieve into a clean bowl. Place this over a bowl of ice and stir to cool the custard as quickly as possible, stirring from time to time to prevent a skin from forming. STEP 6 Pour into an electric ice-cream machine and churn until firm. Remove from machine, transfer to a clean container and freeze for up to a week until ready to serve. 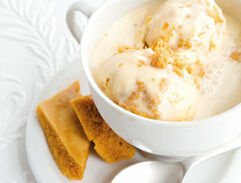 Allow the ice cream to soften slightly at room temperature before serving. Citrus Infuse the anglaise with citrus peel. Finish with a dash of an appropriately flavoured alcohol such as Grand Marnier. and a dash of coffee liqueur to taste. Herbs Infuse with fresh, chopped herbs such as basil, lemon thyme or mint, with freshly chopped herb added to the ice cream as it churns. and follow the same method. Finish with a dash of appropriate alcohol such as Malibu. 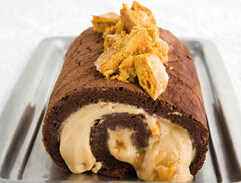 Try this delicious recipe for a decadent Swiss roll with home made honeycomb. 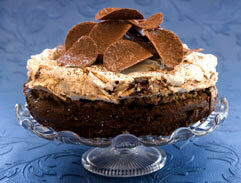 This deliciously decadent dessert is perfect end of dinner treat as the evenings get warmer as we draw closer to summer! The epitome of Easter, chocolate and eggs take centre stage in these rich, utterly decadent desserts – so have them all by the dozen!